Jesus proclaimed the kingdom of God through words and deeds. Many of those deeds involved miraculous healings, which frequently had a double layer of meaning. The physical healing certainly reflects the compassion and mercy of Jesus. But usually there is also a secondary, deeper, spiritual meaning to the miracles. 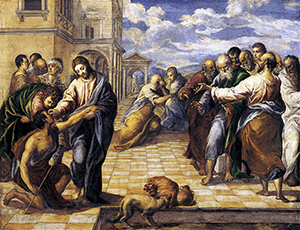 In today’s Gospel, Jesus gives sight to a man born blind, fulfilling the prophecy that the Servant of the Lord was called “to open the eyes of the blind” (Isaiah 42:7). This man not only receives his physical sight but also gains spiritual insight into the person of Jesus Christ. In this story’s dialogue, the man grows in his understanding of and commitment to Jesus as he sees him first as a man (John 9:11), then proclaims him as a prophet (verse 17), and finally accepts him as the Son of Man (verse 38). Like the man, we are blind and in need of healing. Every time we sin, we become blinded to the goodness of God and the needs of others. During this time of Lent, we especially ask Jesus to forgive our sins and heal us of such blindness as he opens the eyes of our hearts and minds so we can recognize him more deeply as a man, a prophet, the Son of Man, and especially the light of the world (verse 5).